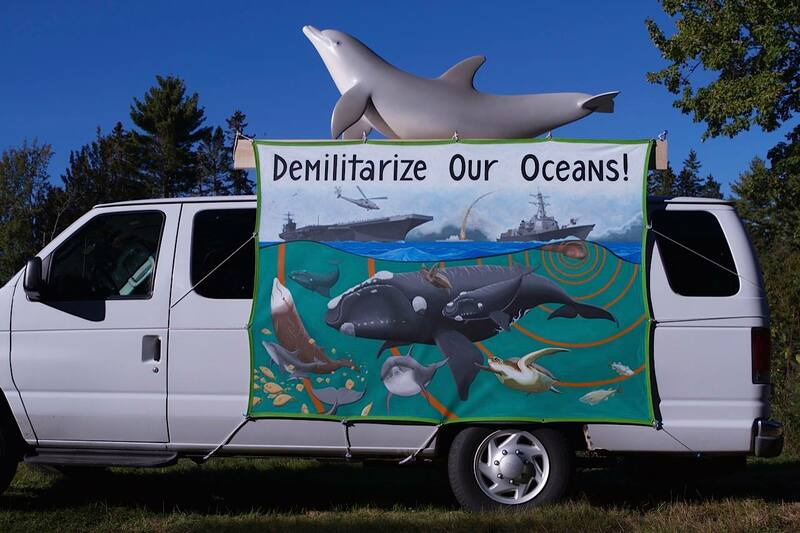 The Maine Peace Walk: Militarization of the Seas -- Pentagon's Impact on the Oceans is underway, accompanied by a van with artist Russel Wray's banner and rooftop sculpture of Maka the dolphin. Marine animals are harmed by sonar used by the U.S. Navy, and all life in the oceans and on the planet is harmed by the Pentagon's immense carbon footprint. 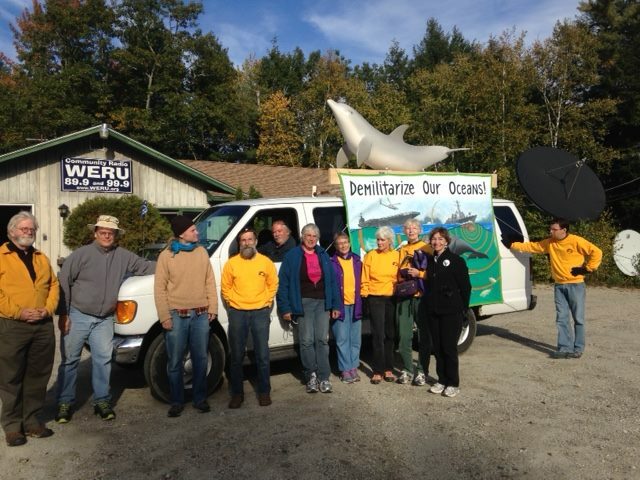 Day two of the walk ended at Community Radio WERU's office in Blue Hill. 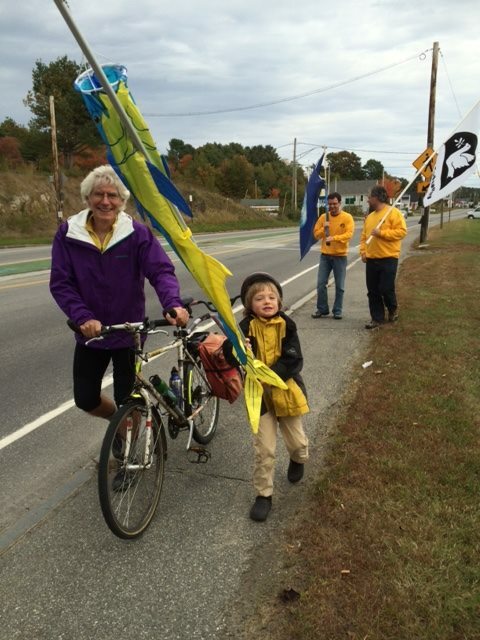 On day three as the walk passed through Belfast, Maine, some young peace walkers joined in for a part of the journey. 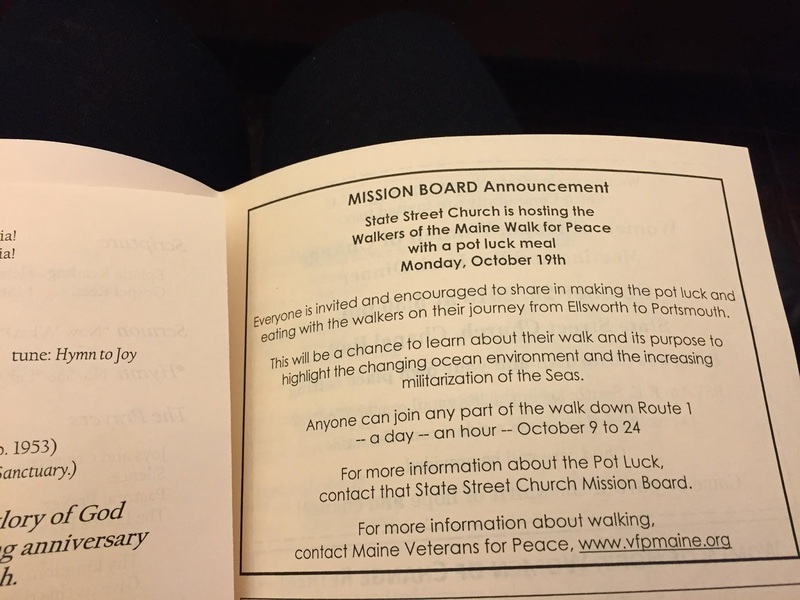 Anyone can join the walk through Oct. 24 for an hour, a day, or all the way to Portmouth, NH. Full details may be found here on the Maine Veterans For Peace website. This young peace walker appears to be carrying a koi nobori, a traditional Japanese fish banner flown to honor the energetic spirit of young boys. Japan's oceans have been severely impacted by ongoing U.S. military presence, and we have seen vigorous resistance from its citizens, including residents of the island of Okinawa. Japan's water table, offshore fisheries and the Pacific Ocean entire are being seriously polluted by the ongoing meltdown of the nuclear reactor at Fukushima (built by U.S. corporation General Electric) in the years since a catastrophic earthquake and tsunami damaged it. High levels of radiation are still interfering with any clean up efforts, and 20-50 times higher than "normal" levels of thyroid cancer in children around Fukushima are already manifesting. 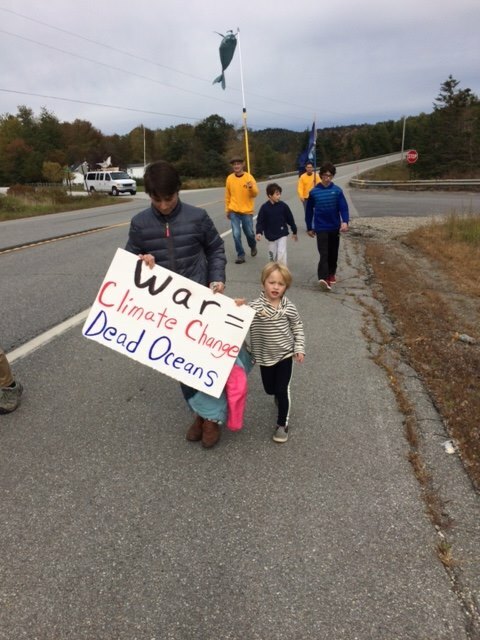 For all the children of the planet, consider raising up your voice in defense of the oceans. The seas do not belong to the Pentagon or any other country's military -- they belong to the life forms that thrive there! If we fail to recognize this and act soon, the result may be the demise of all life on Earth. Waging endless war consumes massive amounts of fossil fuels and lays waste to significant environmentally sensitive places on the planet – particularly the oceans.